The Longs Drug Stores tradition of caring began in 1938 when brothers Joe and Tom Long opened the first Longs store and helped institute the idea of self-service in the retail drug industry. Low prices, excellent service, and a tradition of "treating others as we, ourselves, would like to be treated" brought quick success to the first Longs Drug Store. 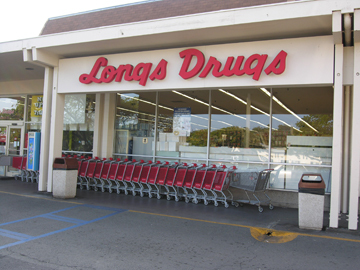 Today, Longs Drug Stores is one of the most recognized retail drug store chains on the West Coast and in Hawaii. Through more than 500 stores in California, Hawaii, Washington, Nevada, Colorado and Oregon, Longs serves the health and well-being needs of consumers with customer-oriented pharmacy services and convenient product offerings that include over-the-counter medications, photo and cosmetics.